Most of the green market hype has targetted newcomers, Kylea’s Total Living Drink Greens which launched a few months ago. And they’ve held their rightful position as our top green drink powder on my top 10 superfood green drink reviews list ever since. And it is going to be a difficult mission to dethrone them. So no, this Natrogix Green Superfood review isn’t going to be the review that dethrones Total Living Drink Greens, but that doesn’t mean it isn’t a worthy purchase, particularly for the budget-minded buyer. 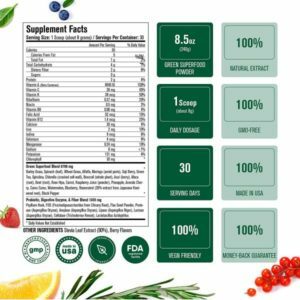 The key component and biggest redeeming quality for this Natrogix Green Superfood review is without question, its value to the consumer. It isn’t a robust experience, but it is incredibly affordable. Natrogix is a USA based health supplement company. They offer a variety of health supplements, including fish oil, milk thistle and turmeric supplements on their website. They claim their product lines are derivatives of input from doctors and sports nutritionists. They also claim to use ingredients which haven’t been exposed to heavy metals and various other toxins, however, stop short of proclaiming GMO-free or organic based. They have a crazy return policy which allows consumers to return their supplements within one year’s time. They also have an approved Amazon store, further legitimizing them in the green powder space. Natrogix is a legitimate company, I can’t find any complaints of billing scams associated with them, and they have a pretty amazing return policy which should comfort first-time buyers of any of their products. Back in 2015, Natrogix experienced record growth, mostly due to a product that’s called Tinnitivix. This is a holistic tinnitus solution. Natrogix is a serious competitor in the health supplement space. Natrogix Green Superfood ingredients are a bit thin, however, it is important to note that this is more of an economic purchase. When you make an economic purchase, such as Natrogix Green Superfood, you aren’t getting the same quality as you would be from Kylea Total Living Drink Greens. That said, you are paying less of a price. Natrogix Green Superfood has two blends. One is for probiotics, the other is for its green superfoods. In each case, you can only see the total ingredient amount of the blend, not each individual ingredient. This is relevant because they could potentially skimp you on more valuable ingredients as a strategy to save money. I wouldn’t be able to confirm such activity because as stated, we have no idea how much of each ingredient is used. This blend is the heart of the matter. This is why you buy Natrogenix Green Superfood powder, for the nutrient-dense greens. This is a rather robust green blend, for all intents and purposes. Barley Grass – Grasses are healthy. And this blend has two great ones, starting with Barley grass. Barley grass is a wonderful source of iron, magnesium and B vitamins. Spinach – Spinach is an unrivaled top superfood. It is loaded with iron and niacin and zinc. Wheat Grass – Wheatgrass is our compliment to barley grass. Wheatgrass became incredibly popular in the 90’s as a shot you could get at smoothie shops. And it remains popular in such capacity. And rightfully so, starting your day with wheatgrass means getting a good supply of phosphorus, magnesium, and calcium, just to start. It can also benefit your digestion. Goji Berry – Goji berry has been consumed by South American aboriginals for centuries. Ingesting goji berry can really contribute to increased immunity to a host of evil doing viruses. Green tea – Green tea is the “calming caffeine” of the energy drink world. And for good reason, green tea also contains the amino acid, L-Theanine, which helps to take the edge off caffeine’s normally hard crash. Additionally, green tea is full of antioxidants which help inhibit the damage of free radicals on cells. Chlorella – Chlorella is widely known for its ability to detoxify the human body, which is a good thing considering our everyday exposure to heavy metals. Brocolli – Both spinach and broccoli are two of the most powerful superfoods known to man. One notable nutrient in broccoli is vitamin K, which many people simply don’t get enough of. It also has liberal amounts of vitamin C, which can help prevent cases of flu and colds. The digestive blend is a nice addition to Green Superfood’s formula. Probiotics and fiber truly compliment nutrient-dense plants because they help to stimulate nutrient absorption. The sad fact of the matter is, many people have difficulty absorbing nutrients due to poor gut health. Probiotics and fiber tend to ramp up gut health, making the ingestion of superfoods a more meaningful experience. There are two notable fibers flanked within some good probiotics. Psyllium Husk – Psyllium Husk is often used to help people suffering from constipation, but conversely, it can also be used to help people with diarrhea. Another notable benefit is that it seems to help lower blood sugar levels in those suffering from blood sugar issues. Flax Seed Powder – Flaxseed is one of the few vegan Omega 3 fatty acid sources. It also contains antioxidants. Natrogix Green Superfood ingredients as seen on the manufacturer’s label. In order to assess the true value of Natrogix Green Superfood, we must highly take into consideration the cost. Because when compared to some of the products listed on my top 10 superfood green drink reviews list, Green Superfood’s redeeming quality, the quality which makes up for thinner ingredients, is the lower cost of entry. You get 8 grams per serving, which is an average experience. If you buy directly from the manufacturer, they have the price listed at $19.99, and claims that it is normally $39.99. I’m going to bet that the price is always $19.99 and the crossed out price verbiage is just marketing. So let’s see how much value we end up with. If you get 30 servings at $19.99, that’s .66 cents per serving of 8 grams. Again, cost does matter. And when it comes to Natrogix Green Superfood value, it is definitely solid. Again, you are getting a lesser green drink powder experience, but the price of the product reflects that. For someone on a budget, this could be a wonderful inclusion in their diet. Because the blend isn’t overwhelmed by leafy greens and there are some berries, you tend to taste the sweetness a lot more. You will immediately notice a berry burst on your tongue. The taste is good, particularly for those who maybe aren’t used to drinking green drinks. Being an economic formula, Natrogix Green Superfood does a great job supplying the consumer with a number of powerful leafy greens and digestive health. You aren’t getting the full slate, but you also aren’t paying that kind of inflated price, either. Standard, but good, ingredients. The price is economical and fair, which serves budget buyers well. Natrogix is a legit and thriving company and they offer an amazing return policy. It’s a budget drink, don’t expect the moon. You get what you pay for, but, you definitely pay a fair price. I can’t put Natrogix Green Superfood powder on my top 10 superfood green drink reviews list. I truly think that price and value matter a lot when it comes to a top green drink experience, however, I don’t think that a low price is the highest factor. You could also buy a more expensive, more robust green drink powder and simply take less of it per day and probably make out better. It really is all about robust ingredients.